Hi everyone! It’s been a while since I last updated my blog as I was quite busy focusing on other endeavors, plus I found nothing interesting to write about just till now. The last two weeks was definitely something as we saw our index go to new highs, but the real star of the show was APM, gaining about 300% in a span of 2 weeks. Wow another KABOOM stock this year adding up to the names MAKE, PXP, TDY, CAL, ORE, NI, DIZ, etc etc.. having watched all of the price action in these stocks, I feel like I have developed a feel for opportunities like this–or I may just have been lucky hehe. These rare moments, if well played, can definitely boost one’s portfolio immensely. Anyway, I’m thankful that I got lucky to ride APM, even though it was a bit late, profit is profit. I bet the insiders are laughing their asses off with their immense profits, or are they? Not sure if the play here is finished but I can see that it was well distributed. The recent move in APM showed us that people are willing to buy into something that is deemed to be of immense value even if there’s no assurance yet. I remember DIZ‘s story.. hahaha. some people valuing it at 100 per share? Wow… Just wow. I wonder where they are now? Don’t be surprised with the irrationality of the market, from time to time, there will be stocks flying on a speculative basis alone. Learn to ride the market’s emotions and sentiments. Know the players of the market. Watch the price action. Curb your greed. There are times when the crowd will feel scared to buy into something that hasn’t proven itself yet, eg. TDY at 5.00+, DIZ at 16+, APM at .30 to 40+, CAL at 10+, MAKE at 6+, etc. often times traders see stocks that seem scary because they don’t know the reason for its rise. With reason or not, one important thing to look at is the volume. You may not know why it is moving, but you’ll definitely see the degree of activity in the stock. After a long sleep, why would a stock suddenly spike in volume? Based on my observation, most of these double your money (or more) stocks still rise after its initial movements. Reason for this is that more and more speculators try to come up with an explanation, more and more stories are created, thus fueling the curiosity of the crowd. No one can get it perfect when it comes to moments like these. No guts, no glory. When the market shows irrationality, step aside and try to be rational. This doesn’t mean that you should immediately shy away from the opportunity just because you have failed to identify sufficient fundamentals to support the price move. Just think of a stock as a “commodity”, and apply the basic principles of supply and demand. In short term bursts, the crowd doesn’t care at all, they will buy into any story that will “supposedly” lead them to their dreams. Emotions make the market fun and alive. Always think out of the box, destroy the box if you can. Be one step ahead of the crowd. Anyway, I think I’ve talked too much. Sorry, Insomniac mode I woke up at 2:30 AM lol and now, it’s almost 6:00 am. 2. ANS – Speculative and pure chart based play, I just bought a small position, digging deeper to back up my decision on whether to add or not. 3. 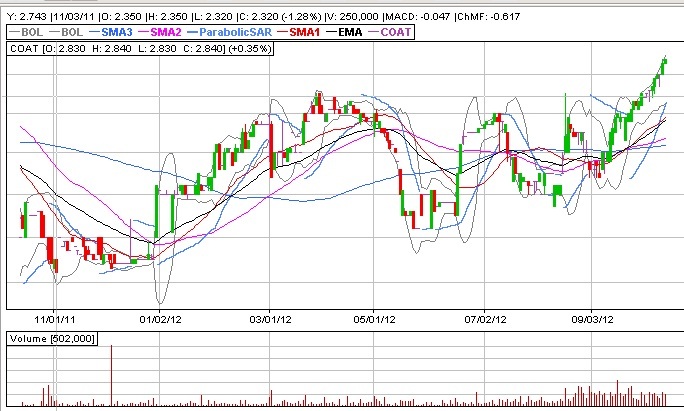 COAT – I like the charts broke it’s 52 week high of 2.75, and is now trending above that area. Lot’s of buy back disclosures from the company. I wonder what’s their plan. Volume seems to be building up. Looking forward to add more. 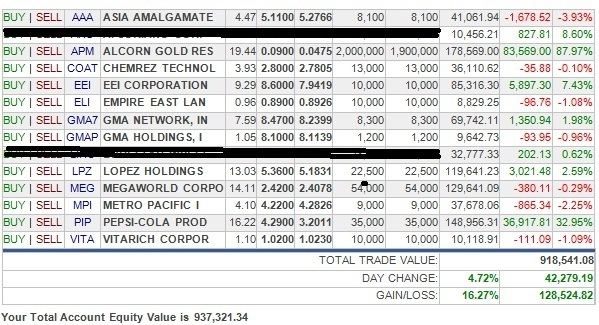 From what I’ve gathered, this company is owned by D&L (http://www.dnl.com.ph/) which will have their IPO this 4th qtr, hmmm… Coincidence? 4. EEI – nothing much to say here. same story. good stock. just holding. looking for opportunity to add. I feel stupid though for not holding this way back then when I had a bigger position in it at near 6.50. Shows that one should not be swayed by the short term fluctuations of the market, focus on the big picture. 11.VLL – for some crazy reason, I just feel like there’s potential in this stock. Just give it patience, trading at low a low PER compared to the market. I like the charts. Their starting to work on their malls, this’ll add value to the stock especially if their malls are a hit. Their housing projects are also strategically located near future infrastructure projects. Once these infra projects are developed there might be more people interested in living near these areas. Anyway, I’ve read a detailed report on this, I’ll just edit/add info in the future. Please feel free to ask share your comments, insights, and suggestions. You may also ask me questions through the blog or in my FB page. Thanks! Sometimes, it pays to be CRAZY. 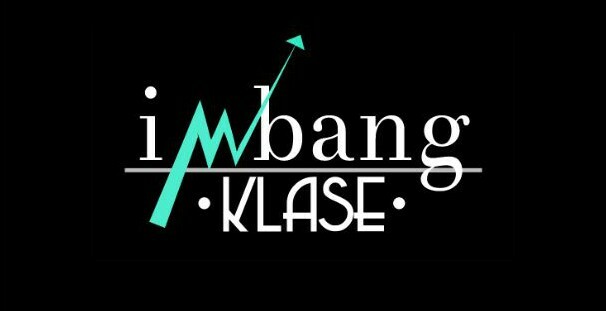 This entry was posted in Imbang Klase's Adventures on October 11, 2012 by imbangklase.